a.k.a " The Jammer "
This was the first truck I have owned. I bought it in 1992. At the time I was driving a 1986 Ford Thunderbird. We had a bad winter that year. So bad that I wound up missing several days of work just by not being able to get out of my driveway. That did it for me. I was ready to buy myself a truck. 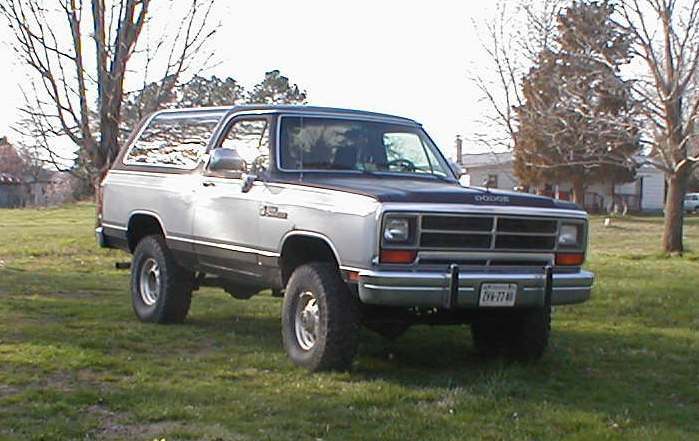 I started shopping around when I came across the RamCharger. I then thought this was perfect since I had children too and the whole family would be able to ride in it. Took it out for a test drive and liked what I had underneath me. Thirty minutes and $8995 later....it was in my driveway. It then became my daily driver and my now ex had the T-Bird. Well with the gas mileage these guys get, it eventually became too much to use it as a driver commuting up and around Washington D.C. every day. I wound up getting a 97 Chevorlet Malibu and my truck was retired to a semi-daily driver. As gas prices soared, the drive time decreased but there was no way I was getting rid of my Dodge. She's still very dependable and still loves to play. I decided it was time to give a little back to her for all the years of dedicated service.